The QWizard class provides a framework for wizards. A wizard (also called an assistant on macOS) is a special type of input dialog that consists of a sequence of pages. A wizard's purpose is to guide the user through a process step by step. Wizards are useful for complex or infrequent tasks that users may find difficult to learn. 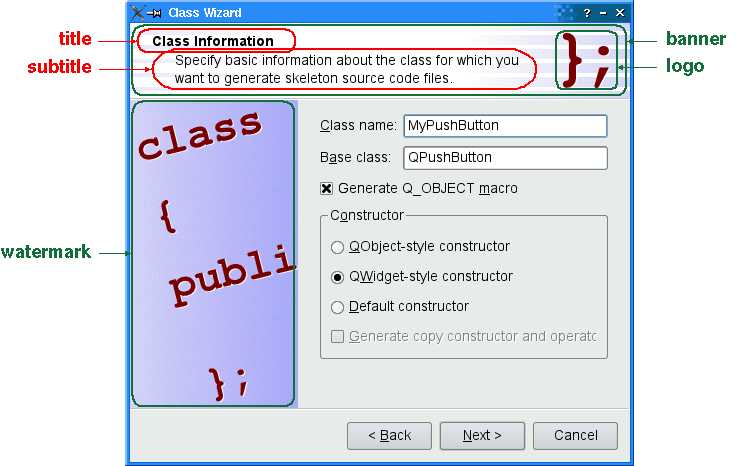 QWizard inherits QDialog and represents a wizard. Each page is a QWizardPage (a QWidget subclass). To create your own wizards, you can use these classes directly, or you can subclass them for more control. 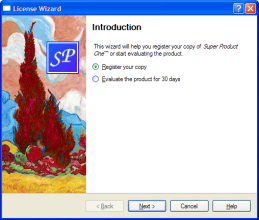 The following example illustrates how to create wizard pages and add them to a wizard. 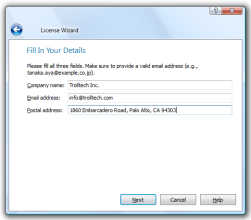 For more advanced examples, see Class Wizard and License Wizard. QLabel *label = new QLabel("This wizard will help you register your copy "
You can explicitly set the look to use using setWizardStyle() (e.g., if you want the same look on all platforms). Note: AeroStyle has effect only on a Windows Vista system with alpha compositing enabled. ModernStyle is used as a fallback when this condition is not met. In addition to the wizard style, there are several options that control the look and feel of the wizard. These can be set using setOption() or setOptions(). For example, HaveHelpButton makes QWizard show a Help button along with the other wizard buttons. When a subTitle is set, QWizard displays it in a header, in which case it also uses the BannerPixmap and the LogoPixmap to decorate the header. The WatermarkPixmap is displayed on the left side, below the header. At the bottom, there is a row of buttons allowing the user to navigate through the pages. The page itself (the QWizardPage widget) occupies the area between the header, the watermark, and the button row. Typically, the page is a QWizardPage on which a QGridLayout is installed, with standard child widgets (QLabels, QLineEdits, etc.). The watermark, banner, and logo pixmaps are ignored by the MacStyle. 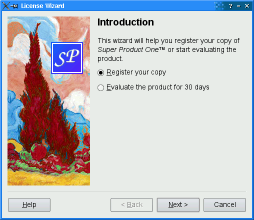 If the BackgroundPixmap is set, it is used as the background for the wizard; otherwise, a default "assistant" image is used. The title and subtitle are set by calling QWizardPage::setTitle() and QWizardPage::setSubTitle() on the individual pages. They may be plain text or HTML (see titleFormat and subTitleFormat). The pixmaps can be set globally for the entire wizard using setPixmap(), or on a per-page basis using QWizardPage::setPixmap(). In many wizards, the contents of a page may affect the default values of the fields of a later page. To make it easy to communicate between pages, QWizard supports a "field" mechanism that allows you to register a field (e.g., a QLineEdit) on a page and to access its value from any page. It is also possible to specify mandatory fields (i.e., fields that must be filled before the user can advance to the next page). The above code registers three fields, className, baseClass, and qobjectMacro, which are associated with three child widgets. The asterisk (*) next to className denotes a mandatory field. Here, we call QWizardPage::field() to access the contents of the className field (which was defined in the ClassInfoPage) and use it to initialize the OutputFilePage. The field's contents is returned as a QVariant. When we create a field using QWizardPage::registerField(), we pass a unique field name and a widget. We can also provide a Qt property name and a "changed" signal (a signal that is emitted when the property changes) as third and fourth arguments; however, this is not necessary for the most common Qt widgets, such as QLineEdit, QCheckBox, and QComboBox, because QWizard knows which properties to look for. If an asterisk (*) is appended to the name when the property is registered, the field is a mandatory field. When a page has mandatory fields, the Next and/or Finish buttons are enabled only when all mandatory fields are filled. To consider a field "filled", QWizard simply checks that the field's current value doesn't equal the original value (the value it had when initializePage() was called). For QLineEdit and QAbstractSpinBox subclasses, QWizard also checks that hasAcceptableInput() returns true, to honor any validator or mask. QWizard's mandatory field mechanism is provided for convenience. A more powerful (but also more cumbersome) alternative is to reimplement QWizardPage::isComplete() and to emit the QWizardPage::completeChanged() signal whenever the page becomes complete or incomplete. The enabled/disabled state of the Next and/or Finish buttons is one way to perform validation on the user input. Another way is to reimplement validateCurrentPage() (or QWizardPage::validatePage()) to perform some last-minute validation (and show an error message if the user has entered incomplete or invalid information). If the function returns true, the next page is shown (or the wizard finishes); otherwise, the current page stays up. When a page is about to be shown, QWizard calls initializePage() (which in turn calls QWizardPage::initializePage()) to fill the page with default values. By default, this function does nothing, but it can be reimplemented to initialize the page's contents based on other pages' fields (see the example above). If the user presses Back, cleanupPage() is called (which in turn calls QWizardPage::cleanupPage()). The default implementation resets the page's fields to their original values (the values they had before initializePage() was called). If you want the Back button to be non-destructive and keep the values entered by the user, simply enable the IndependentPages option. Some wizards are more complex in that they allow different traversal paths based on the information provided by the user. 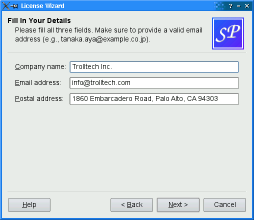 The License Wizard example illustrates this. 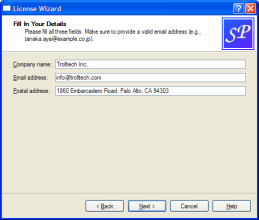 It provides five wizard pages; depending on which options are selected, the user can reach different pages. To start at another page than the page with the lowest ID, call setStartId(). 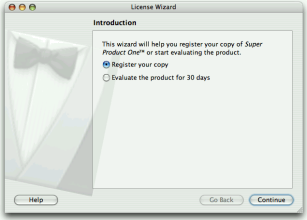 licenseText = tr("<u>Evaluation License Agreement:</u> "
"You can use this software for 30 days and make one "
licenseText = tr("<u>First-Time License Agreement:</u> "
"You can use this software subject to the license "
licenseText = tr("<u>Upgrade License Agreement:</u> "
"This software is licensed under the terms of your "
See also QWizardPage, Class Wizard Example, and License Wizard Example. This enum specifies the buttons in a wizard. See also setButton(), setButtonText(), setButtonLayout(), and customButtonClicked(). This enum specifies various options that affect the look and feel of a wizard. QWizard::IndependentPages 0x00000001 The pages are independent of each other (i.e., they don't derive values from each other). QWizard::IgnoreSubTitles 0x00000002 Don't show any subtitles, even if they are set. QWizard::ExtendedWatermarkPixmap 0x00000004 Extend any WatermarkPixmap all the way down to the window's edge. QWizard::NoDefaultButton 0x00000008 Don't make the Next or Finish button the dialog's default button. QWizard::NoBackButtonOnStartPage 0x00000010 Don't show the Back button on the start page. QWizard::NoBackButtonOnLastPage 0x00000020 Don't show the Back button on the last page. QWizard::DisabledBackButtonOnLastPage 0x00000040 Disable the Back button on the last page. QWizard::HaveNextButtonOnLastPage 0x00000080 Show the (disabled) Next button on the last page. QWizard::HaveFinishButtonOnEarlyPages 0x00000100 Show the (disabled) Finish button on non-final pages. QWizard::NoCancelButton 0x00000200 Don't show the Cancel button. QWizard::CancelButtonOnLeft 0x00000400 Put the Cancel button on the left of Back (rather than on the right of Finish or Next). QWizard::HaveHelpButton 0x00000800 Show the Help button. QWizard::HelpButtonOnRight 0x00001000 Put the Help button on the far right of the button layout (rather than on the far left). QWizard::HaveCustomButton1 0x00002000 Show the first user-defined button (CustomButton1). QWizard::HaveCustomButton2 0x00004000 Show the second user-defined button (CustomButton2). QWizard::HaveCustomButton3 0x00008000 Show the third user-defined button (CustomButton3). QWizard::NoCancelButtonOnLastPage 0x00010000 Don't show the Cancel button on the last page. The WizardOptions type is a typedef for QFlags<WizardOption>. It stores an OR combination of WizardOption values. See also setOptions(), setOption(), and testOption(). This enum specifies the pixmaps that can be associated with a page. See also setPixmap(), QWizardPage::setPixmap(), and Elements of a Wizard Page. This enum specifies the different looks supported by QWizard. See also setWizardStyle(), WizardOption, and Wizard Look and Feel. This property cannot be set directly. To change the current page, call next(), back(), or restart(). By default, this property has a value of -1, indicating that no page is currently shown. X11 and QWS (Qt for Embedded Linux): none. If this property isn't explicitly set, this property defaults to the lowest page ID in this wizard, or -1 if no page has been inserted yet. See also restart() and nextId(). The default format is Qt::AutoText. See also QWizardPage::title and titleFormat. See also QWizardPage::title and subTitleFormat. By default, QWizard uses the AeroStyle on a Windows Vista system with alpha compositing enabled, regardless of the current widget style. If this is not the case, the default wizard style depends on the current widget style as follows: MacStyle is the default if the current widget style is QMacStyle, ModernStyle is the default if the current widget style is QWindowsStyle, and ClassicStyle is the default in all other cases. See also Wizard Look and Feel and options. Constructs a wizard with the given parent and window flags. See also parent() and windowFlags(). Destroys the wizard and its pages, releasing any allocated resources. Adds the given page to the wizard, and returns the page's ID. 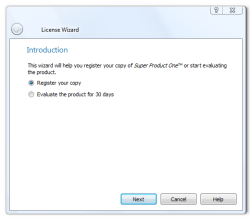 The ID is guaranteed to be larger than any other ID in the QWizard so far. See also setPage(), page(), and pageAdded(). Goes back to the previous page. This is equivalent to pressing the Back button. See also next(), accept(), reject(), and restart(). Returns the button corresponding to role which. See also setButton() and setButtonText(). Returns the text on button which. If a text has ben set using setButtonText(), this text is returned. By default, the text on buttons depends on the wizardStyle. For example, on macOS, the Next button is called Continue. See also button(), setButton(), setButtonText(), QWizardPage::buttonText(), and QWizardPage::setButtonText(). This virtual function is called by QWizard to clean up page id just before the user leaves it by clicking Back (unless the QWizard::IndependentPages option is set). The default implementation calls QWizardPage::cleanupPage() on page(id). See also QWizardPage::cleanupPage() and initializePage(). This signal is emitted when the current page changes, with the new current id. Note: Notifier signal for property currentId. See also currentId() and currentPage(). Returns a pointer to the current page, or 0 if there is no current page (e.g., before the wizard is shown). This is equivalent to calling page(currentId()). See also page(), currentId(), and restart(). This signal is emitted when the user clicks a custom button. which can be CustomButton1, CustomButton2, or CustomButton3. By default, no custom button is shown. Call setOption() with HaveCustomButton1, HaveCustomButton2, or HaveCustomButton3 to have one, and use setButtonText() or setButton() to configure it. Returns the value of the field called name. 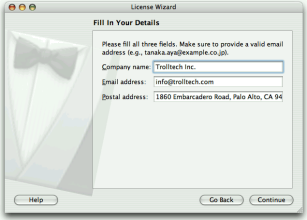 This function can be used to access fields on any page of the wizard. See also QWizardPage::registerField(), QWizardPage::field(), and setField(). Returns true if the page history contains page id; otherwise, returns false. Pressing Back marks the current page as "unvisited" again. This signal is emitted when the user clicks the Help button. By default, no Help button is shown. Call setOption(HaveHelpButton, true) to have one. message = tr("The decision you make here will affect which page you "
By reimplementing this function, you can ensure that the page's fields are properly initialized based on fields from previous pages. The default implementation calls QWizardPage::initializePage() on page(id). See also QWizardPage::initializePage() and cleanupPage(). Advances to the next page. This is equivalent to pressing the Next or Commit button. See also nextId(), back(), accept(), reject(), and restart(). This virtual function is called by QWizard to find out which page to show when the user clicks the Next button. The return value is the ID of the next page, or -1 if no page follows. The default implementation calls QWizardPage::nextId() on the currentPage(). By reimplementing this function, you can specify a dynamic page order. See also QWizardPage::nextId() and currentPage(). Returns the page with the given id, or 0 if there is no such page. See also addPage() and setPage(). This signal is emitted whenever a page is added to the wizard. The page's id is passed as parameter. This function was introduced in Qt 4.7. See also addPage(), setPage(), and startId(). Returns the list of page IDs. This signal is emitted whenever a page is removed from the wizard. The page's id is passed as parameter. See also removePage() and startId(). Returns the pixmap set for role which. By default, the only pixmap that is set is the BackgroundPixmap on macOS. See also setPixmap(), QWizardPage::pixmap(), and Elements of a Wizard Page. Removes the page with the given id. cleanupPage() will be called if necessary. Note: Removing a page may influence the value of the startId property. See also addPage(), setPage(), pageRemoved(), and startId(). Restarts the wizard at the start page. This function is called automatically when the wizard is shown. Sets the button corresponding to role which to button. To add extra buttons to the wizard (e.g., a Print button), one way is to call setButton() with CustomButton1 to CustomButton3, and make the buttons visible using the HaveCustomButton1 to HaveCustomButton3 options. See also button(), setButtonText(), setButtonLayout(), and options. Sets the order in which buttons are displayed to layout, where layout is a list of WizardButtons. The default layout depends on the options (e.g., whether HelpButtonOnRight) that are set. You can call this function if you need more control over the buttons' layout than what options already provides. You can specify horizontal stretches in the layout using Stretch. See also setButton(), setButtonText(), and setOptions(). Sets the text on button which to be text. To add extra buttons to the wizard (e.g., a Print button), one way is to call setButtonText() with CustomButton1, CustomButton2, or CustomButton3 to set their text, and make the buttons visible using the HaveCustomButton1, HaveCustomButton2, and/or HaveCustomButton3 options. Button texts may also be set on a per-page basis using QWizardPage::setButtonText(). See also buttonText(), setButton(), button(), setButtonLayout(), setOptions(), and QWizardPage::setButtonText(). Sets the default property for className to be property, and the associated change signal to be changedSignal. The default property is used when an instance of className (or of one of its subclasses) is passed to QWizardPage::registerField() and no property is specified. Sets the value of the field called name to value. 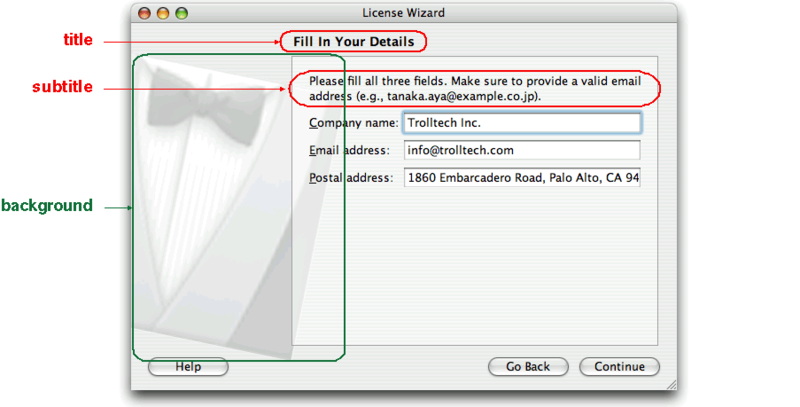 This function can be used to set fields on any page of the wizard. See also QWizardPage::registerField(), QWizardPage::setField(), and field(). Sets the given option to be enabled if on is true; otherwise, clears the given option. See also options, testOption(), and setWizardStyle(). Adds the given page to the wizard with the given id. Note: Adding a page may influence the value of the startId property in case it was not set explicitly. See also addPage(), page(), and pageAdded(). Sets the pixmap for role which to pixmap. The pixmaps are used by QWizard when displaying a page. 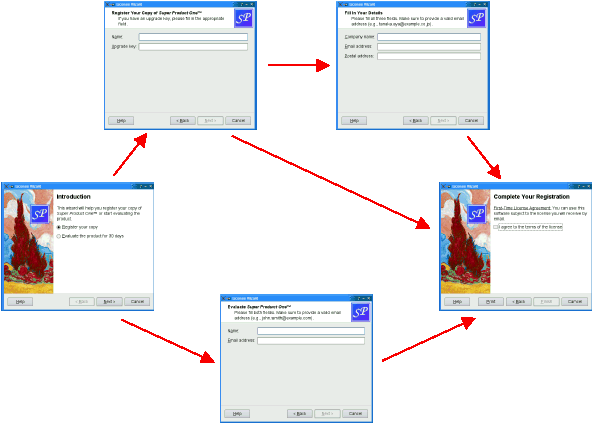 Which pixmaps are actually used depend on the wizard style. Pixmaps can also be set for a specific page using QWizardPage::setPixmap(). See also pixmap(), QWizardPage::setPixmap(), and Elements of a Wizard Page. Sets the given widget to be shown on the left side of the wizard. For styles which use the WatermarkPixmap (ClassicStyle and ModernStyle) the side widget is displayed on top of the watermark, for other styles or when the watermark is not provided the side widget is displayed on the left side of the wizard. Passing 0 shows no side widget. When the widget is not 0 the wizard reparents it. Any previous side widget is hidden. You may call setSideWidget() with the same widget at different times. All widgets set here will be deleted by the wizard when it is destroyed unless you separately reparent the widget after setting some other side widget (or 0). By default, no side widget is present. Returns the widget on the left side of the wizard or 0. Returns true if the given option is enabled; otherwise, returns false. See also options, setOption(), and setWizardStyle(). This virtual function is called by QWizard when the user clicks Next or Finish to perform some last-minute validation. If it returns true, the next page is shown (or the wizard finishes); otherwise, the current page stays up. The default implementation calls QWizardPage::validatePage() on the currentPage(). When possible, it is usually better style to disable the Next or Finish button (by specifying mandatory fields or by reimplementing QWizardPage::isComplete()) than to reimplement validateCurrentPage(). See also QWizardPage::validatePage() and currentPage(). Returns the list of IDs of visited pages, in the order in which the pages were visited.